For the past three months the convection oven in our borrowed Cirrus 920 has been sitting with the factory styrofoam inside and window stickers still in place. 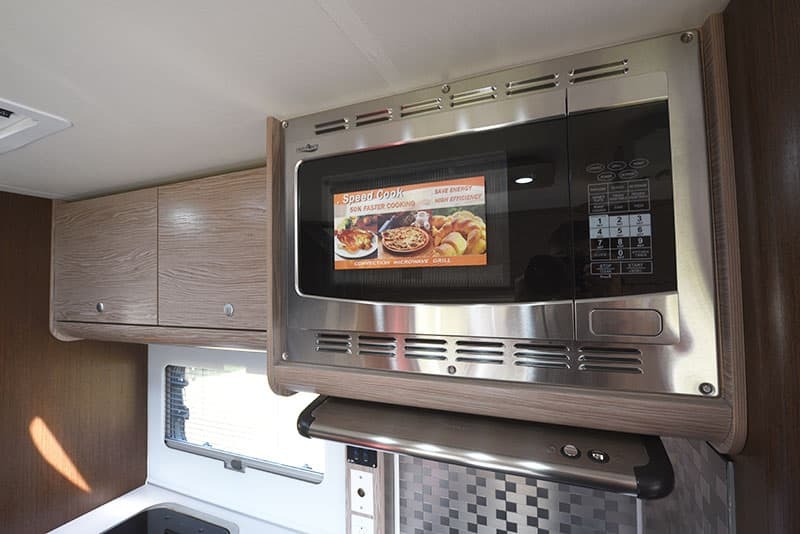 I have used a RV propane oven for many years, but was hesitant to try the convection microwave. I guess you could say that I was nervous about it using it. I don’t know why. What’s the worst that could go wrong? Burnt or under-baked food, right? I guess I just didn’t want the disappointment of it not working. We’ve also been dry camping a lot these past few months and the microwave/oven only works with 110-volt AC power. We could have fired up the onboard Onan generator, but we’re not big fans of using onboard generators and their obnoxious fumes, vibrations, and noise. Since we don’t have a generator in our project camper, we don’t even remember that we have one in the Cirrus 920. We prefer just using our solar and house batteries and letting the 12-volt and USB outlets run everything. 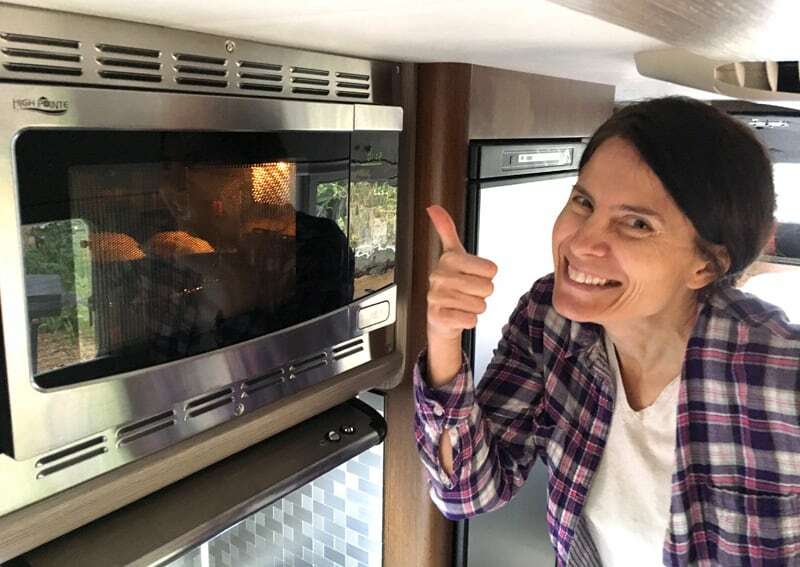 Last week we were at a campground with shore power, so we posted a Question Of The Week asking fellow TCM readers if they use their convection ovens. We also asked for tips on how to bake in them. I figured maybe I could beat my fear and try out the convection feature while we were on electric. Thank you, readers, for giving me the confidence to try it out! 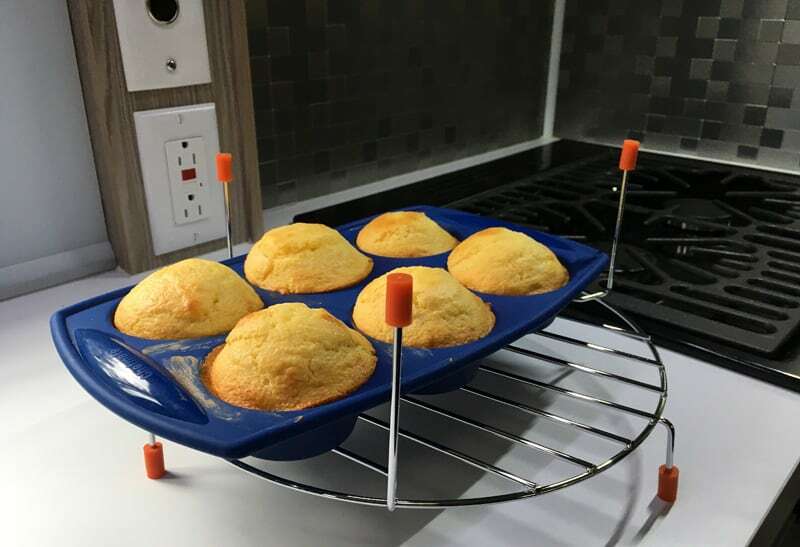 I decided to practice with corn muffins. 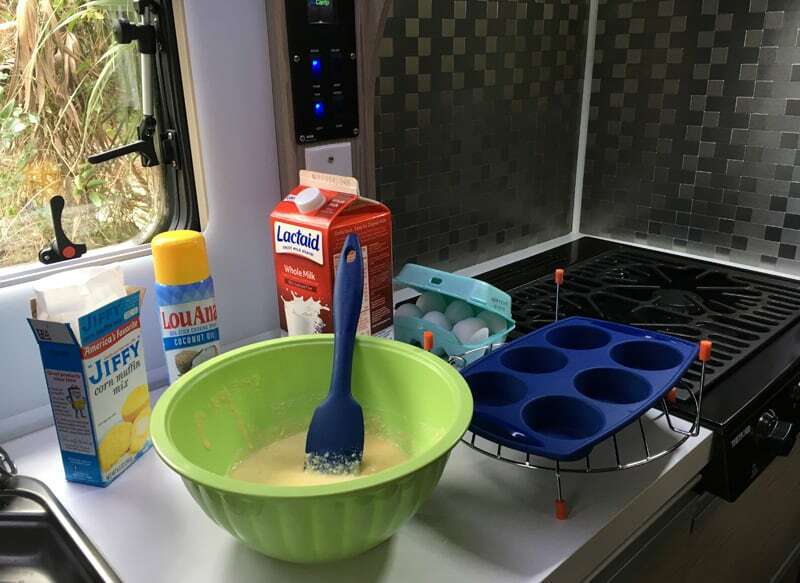 Corn muffins are easy to make and have a short cooking time. I mixed everything up and preheated the convection oven per the instructions in the manual. Within minutes, an awful smell emitted from the unit. We often get a similar smell when we borrow campers with new furnaces. We are inevitably at a campground in cold weather, and starting the furnace for the first time. The new furnace would bake off the dust from the factory, and set off the smoke alarm. How embarrassing! Back to my bake, and cue the fumes, awful smell, and smoke alarm. 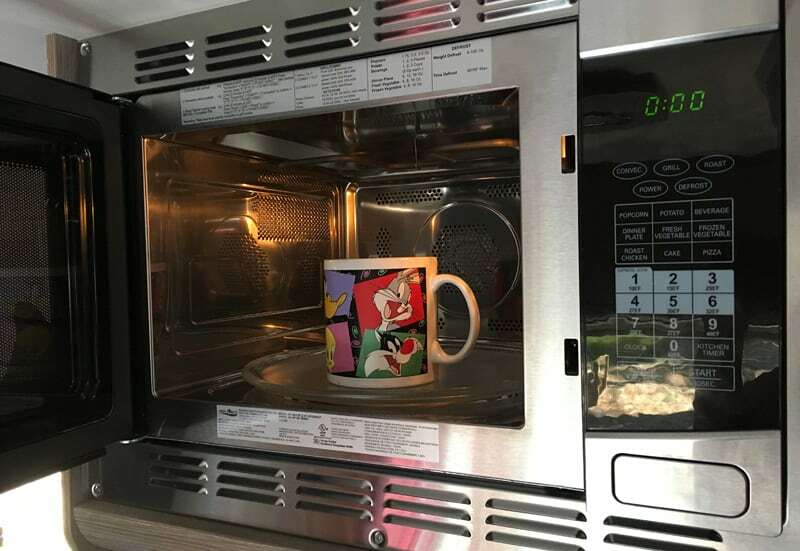 The convection microwave oven had the same smoke alarm experience as all the outgassing fumes from the brand new units. Thank goodness for Fantastic Vents! Immediately Gordon was online searching for how to get rid of the initial burning off smells of a new convection microwave. A quick search found us microwaving a cup of water for about 10-minutes to get the microwave fumes out, and then a pan of water for 10-minutes to get the oven’s fumes out. After twenty-minutes of getting all the fumes to subside, the smell went away and the smoke alarm behaved itself. That should be a Camper Memo. Frugal me found a complete set of silicone pans at a thrift store this past Saturday for $3. I am excited because they fit in a drawer easily and, best of all, they weigh way less than the baking pans I usually use. They also fit in the sink better making them easier to wash. Win, win, win! So, now I have two unknowns; the convection oven and the silicone pan. Having never cooked with silicone before, I wasn’t even sure if I needed to grease them before putting in the batter. Again, quick search on the internet, and – yes, you do! Gordon’s Mom has used silicone to bake, so I called on her for some advice. She said that sometimes when she cooks with silicone the food doesn’t brown on the outside like it does with regular pans. She also said to put something underneath like a cookie sheet or larger pan so that I wouldn’t get spills. I could see it making a real mess with how floppy the pans are. The convection microwave came with a portable grill-like shelf, which is super convenient. So, I placed the muffin pan on that. It was time to face my fear. 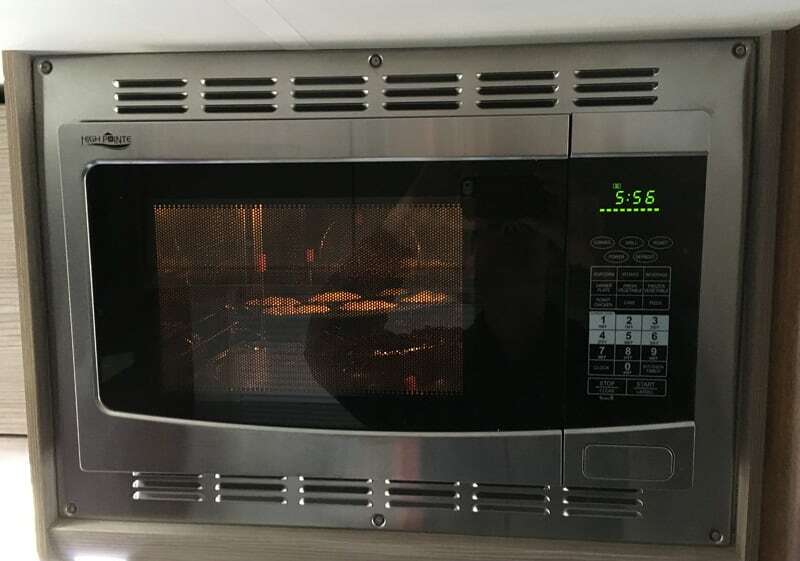 The convection oven was preheated to 400-degrees and the batter was ready to be cooked. I set the time for 10-minutes and put the pan in. I remembered the advice of Angela Klinger to monitor the oven temperature, which I did. Ten minutes went by, I opened the door and they were not quite ready. Another two minutes brought them to perfection. They looked great and they tasted even better. Now I’m off to something more challenging – cake! Gordon is very excited.